Small batch brewing kits have been around for a long time. You've probably been in someone's garage and seen dusty artifacts left behind from an old Mr. Brew Machine. Unfortunately that's usually where their final resting place seems to be after one or two rounds of beer making. When I talk with new brewers that started with a kit like this, I almost always get a story about how someone bought them the plastic barrel brewing machine and they tried it a few times. "Did you like the beer? ", I ask. The answer is usually the same. 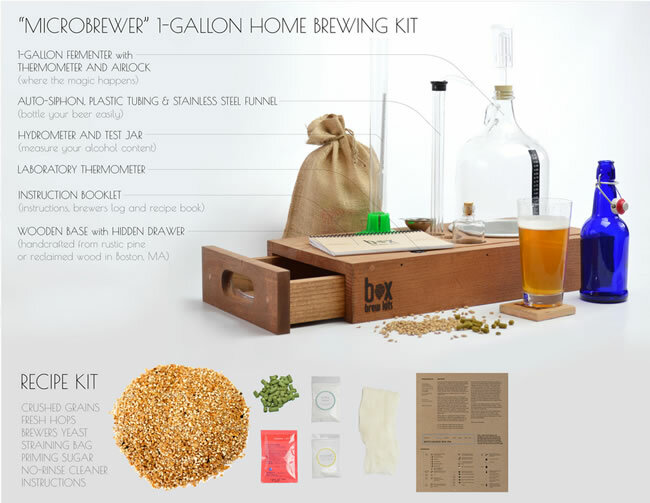 "It was ok."
Most beginner home brewers are bestowed one of these kits as a gift, not knowing the limitations they have. But, what are the limiting factors? Is it the equipment, the ingredients, the directions? I decided to dive into a number of the small batch kits currently available on the market to determine which are worth the scratch and which deserve the scrap. Small batch homebrewing kits can come in handy, not just for a beginner brewer, but also a veteran looking to experiment with new ingredients without the load of a 5 gallon batch. The small volume kits also benefit people with small spaces that want to brew great beer. These kits have small footprints and fit easily into small kitchens and apartments. Sometimes referred to as apartment brewing kits, these mini breweries make around 1 to 2 gallons of beer depending on which one you get. Here's the systems I tested and a breakdown of the supplies that comes with each kit. I chose to test the base model for each kit when available. Each kit tested had its pros and cons, but none of these kits produced beer that was "undrinkable" by any means. Some of the ingredient kits were better than others, but the equipment that came with each kit is what I thought was the most important thing to consider when buying one. The winner in terms of equipment is the Brewer's Best 1 Gallon Kit. 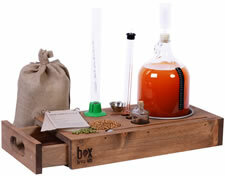 This kit comes with a lot of high quality supplies that can assist any small batch brewer. You can continue to use many of the tools if you decide to brew larger batches of beer in the future including the hydrometer, thermometer, test jar, bottle brush and airlock. You can even use the glass jug to store harvested yeast from larger batches. The larger primary fermentor and glass secondary fermentor for conditioning and dry hopping paired with all the other vital brewing tools is what puts this kit into the winning position. The larger 2 gallon primary fermentor will allow some room for the krausen (beer foam) as the yeast ferments. Just like many of the other kits tested, you still have to buy more supplies. You will need a capper, caps and bottles. These are essential items that should be included with a kit like this. Other items you will need are a kettle and spoon for stirring. No ingredient kit comes with this kit, but I find it is better to get the right equipment and then see what style of brewing you are interested in. With this kit you can brew extract, partial mash or all-grain batches, which are all available at your local homebrew shop or online. If you love hoppy IPAs and Pale Ales and want to do some small batch dry hopping, the Brewer's Best 1 Gallon Kit is the kit for you. 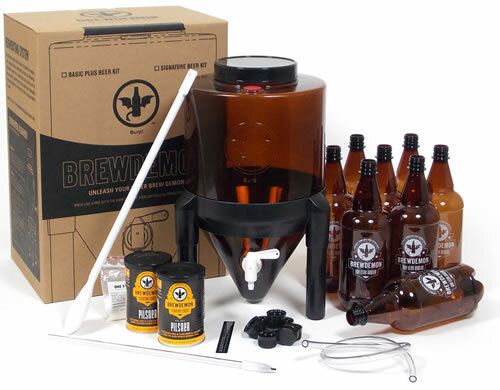 The Brew Demon 2 Gallon Kit comes in at a close 2nd and comes with EVERYTHING to make beer. This kit is reminiscent of the Mr. Brew Machine, but has some nice features that should be attractive to small batch brewers. The conical design allows yeast to settle on the bottom of the fermentor for easier harvesting after transferring your beer to bottles and unlike other kits, this one includes a liquid crystal thermometer that applies to the fermentor. This allows you to see the temperatures during fermentation and before pitching yeast. Not that you have to brew with the Brew Demon ingredients, but an extract kit is included along with bottles and caps making this a complete solution for a beginner small batch brewmaster. The conical easily fits into a standard sized sink for cleaning and sanitizing. We had a few hick ups with the spigot included with this kit, but the customer service we received from Brew Demon was AMAZING and they quickly sent out some missing parts (caps) and a few backup spigots for the one that broke during usage. We tested the Pilsner extract that came with the kit and were pleasantly surprised by the full flavored results. Another bonus with the Brew Demon design was the ability to purge the system with CO2 after filling the fermentor. We also fitted their air release valve with a 3-piece airlock after this photo was taken. All in all, the Brew Demon conical fermentor is a great tool that mimics large brewery style conical fermentors. The Hop Box made from reclaimed lumber is a solid homebrew kit and also a work of art. Each kit comes with a handmade storage box carved from locally sourced wood and high quality brewing supplies. This really is a homebrew kit you can display and show off to your friends. The stainless steel funnel and extra glass vial make it easy to experiment with extracts and store yeast samples. The kit comes with a mini auto-siphon that really comes in handy for transferring out of the glass fermentor and into either bottles or a mini keg setup. The kit also comes with a hydrometer, lab thermometer and test jar. Our hydrometer was broken when it arrived, but the team at Hop Box did offer to replace it at no charge. Most of these small batch kits try to keep the math out of your brew day, but relying on bubbles in the airlock to judge when fermentation is complete is not a very scientific way of making beer. Buy a good beginner brewing book and use the hydrometer to test final gravity to know when your beer has finished fermenting. The Hop Box is a beautiful homebrew kit with some very nice tools and worth considering if you want a show piece as well as a brewing kit. After reviewing and testing these kits, I'm left with an urge to pull out my 5 gallon system and brew a full batch. That being said, you have to remember what these kits are made for... beginners, experimenters and economical or space deprived brewers. If you are in the market for one of the mini brew systems, just take a little time to review the gear that the kits come with that can be reused for the second batch. The powdered sanitizer (cleanitizer) that comes with most of these small kits is slow and not especially effective. Instead get a no-rinse sanitizer like Star-San or Iodophor. Christian Lavender is a father, husband, computer geek, beer writer and homebrewer in Austin, TX. 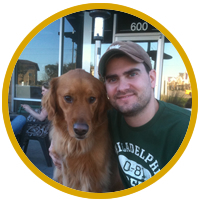 He currently brews on Picobrew's Zymatic and enjoys styles ranging from hoppy barrel aged barley wine to funky sours.